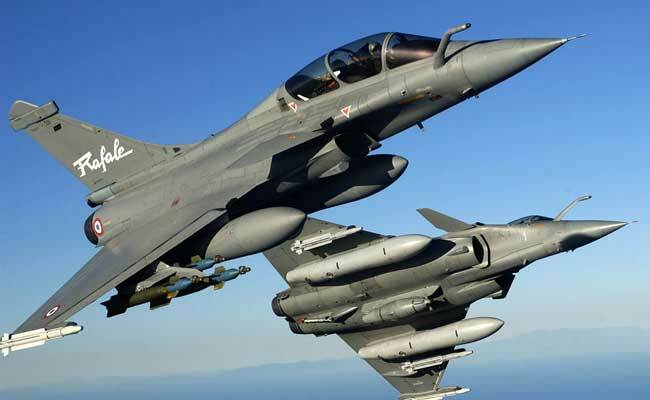 Congress leaders Ghulam Nabi Azad and Randeep Surjewala said while 36 Rafale jets were sold to India at 7.5 billion Euros in 2016, 48 jets were sold to Qatar and Egypt at 7.9 billion Euros in 2015. The Congress on Friday accused the Modi government of "compromising" national security and causing a loss of over Rs 12,000 crore to the taxpayer with its deal to buy 36 French Rafale fighter jets. Quoting from the annual report of Dassault Aviation, makers of the fighter aircraft, the party alleged that the company sold each jet to India at Rs 351 crore higher than those sold to Qatar and Egypt 11 months ago. This amounted to Rs 1,670.70 crore per aircraft for India and Rs 1,319.80 crore to Egypt and Qatar. There was a difference of Rs 351 crore for each aircraft, the party claimed. Addressing a joint press conference, Mr Azad, Mr Surjewala and former Minister of State for Defence Jitendra Singh asserted that the government had adopted complete opaqueness in the purchase of the Rafale fighter aircraft. Mr Azad asserted that had the Modi government not cancelled the deal struck by the UPA dispensation for 126 Rafale jets, it could have saved Rs 41,212 crore. "The Modi government's 'diversionary tactics' on Rafale deal has left more questions than answers," they said in a statement. Accusing the prime minister of compromising on national security and interests, Mr Azad asked why were only 36 fighter jets purchased instead of 126 jets for which international bids were called for. "Is this not compromising with national security? Why are prime minister and defence minister hiding the purchase price (of the jets)? Is it correct that per aircraft pricing of Rafale as per bid dated 12.12.2012 (during the UPA-Congress government) was Rs 526.1 crore as against the Modi government's per aircraft purchase price of Rs 1,670.70 crore?" he asked. Mr Surjewala said the deal was also made in absence of prior clearance from Cabinet Committee on Security, thus sacrificing the national interest and bypassing Hindustan Aeronautics Limited (HAL) on the Rs 36,000 crore 'offset contract' in favour of a private entity with no defence manufacturing experience. "Grave apprehensions and claims of insurmountable loss being caused to public exchequer stand exposed as the government refuses to state the truth. A huge scam is brewing in procurement of fighter aircrafts for the Indian Air Force, yet the Modi government remains opaque, intransient, obscure and obstinate," the Congress leaders alleged. The BJP, however, countered the charges, accusing the Congress of "misleading" the nation on the issue. It said the Congress-led government never inked any deal for the fighter aircraft before 2014 and sat on its file due to its "greed". BJP spokesperson Anil Baluni called the Congress allegations a "pack of lies" and part of its strategy to spread "untruth and confusion" against the Modi government. "The Congress has again misled the country over a sensitive issue like defence. It is comparing a best deal struck by this government in the national interest with an alleged deal of the UPA government which had never happened," the BJP's national media head said. The trust is that the UPA dispensation sat on the Rafale deal file for reasons of its "greed and personal benefits" and compromised the nation's security interests, he claimed.